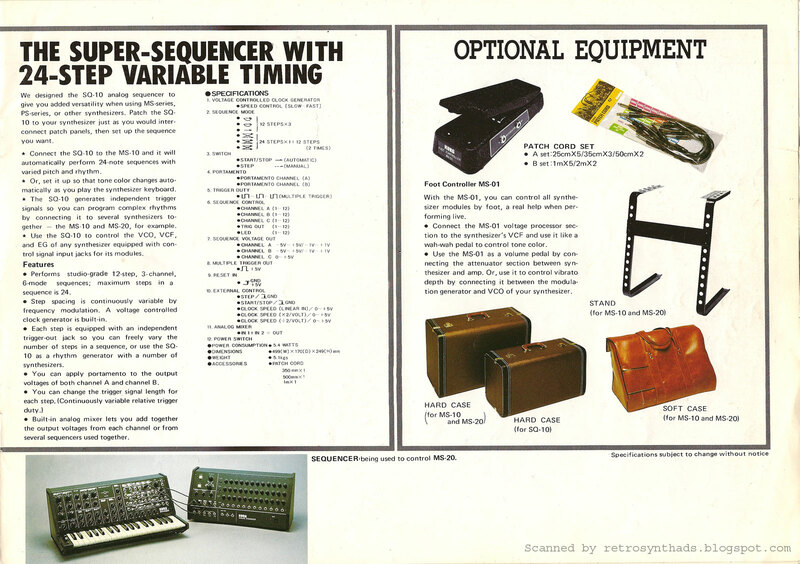 Strider Systems Inc. Microsequencer "The Live One" 1/6-page black and white advertisement from the bottom right-hand side of page 57 in the June 1978 issue of Contemporary Keyboard Magazine. 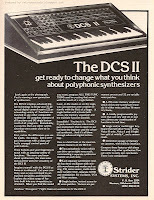 The DCS-1 and DCS II were definitely the focus of Strider Systems Inc. in magazines like Contemporary Keyboard and Synapse - both in terms of advertisements and product promos. But those were not the only products coming out of this five-man shop in Oklahoma. A few other products managed to make it out of the factory at one time or another. For example, what sounds like a really cool little digitally controlled device could be spotted in the March/April 1978 issue of Synapse called the Digital Envelope Generator (DEG). "Strider Systems Inc. has release a Digital Envelope Generator (DEG) designed for the original equipment manufacturer market. The DEG is a micro-computer controlled, 37 input, single output audio mixer and keyboard scanner combined on an 8"x10" printed circuit board. The microcomputer scans a multiplexed 37-note keyboard for keypress and release information to generate independent loudness transients for each of the 37 audio input channels. The factory presets 64 ADSR and LFO envelopes, and custom programming is available on a 10-day turn-around. In quantities of 100 units and up, the DEG sells for $350.00, with small quantities for $750.00 per board. For more information, write: Strider Systems P.O. Box 2934, Norman, OK 73070." I contacted co-owner and President of Strider Systems Inc. Jim Christensen about the DEG to see what he could remember about it. "If I remember correctly, the DEG was a sort of probe to see if there was any market for this kind of product targeted at Original Equipment Manufacturers (OEMs), as we were beginning to realize that we were too small and underfunded do the whole thing ourselves. We had a prototype running but did not do any layout for the full board, as we had no response. Thinking back, it's clear that other manufacturers would want to keep the digital portion of the system as a core technology rather than farming it out." 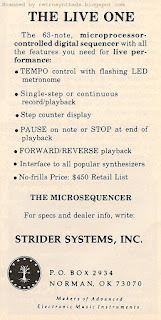 Although I couldn't find any DEG advertisements in CK or Synapse (makes sense since a product like this would more likely get advertised in manufacturer/trade mags), another product that came out of Strider in 1978 did deserve a few advertising dollars - the Microsequencer. 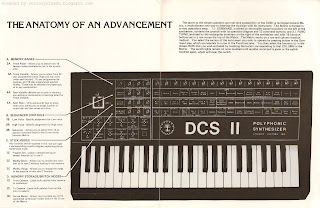 This piece of kit popped up on my radar early on in my Strider Research and I suspected the technology around it was pulled directly from the 256-note sequencer that was available on the DCS II synthesizer. This $450.00 sequencer was only 63-note. And when I say "only", that's "only" when compared to the 256-note sequencer integrated into the DCS II. 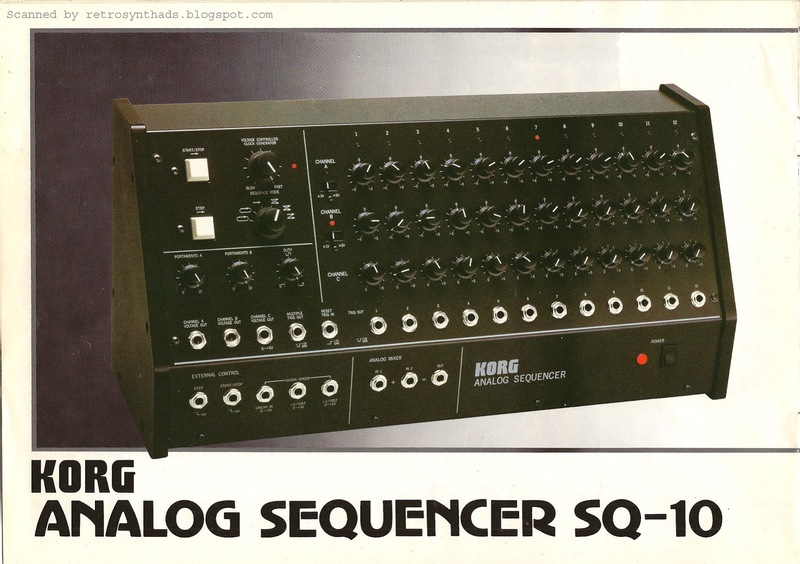 For 1978, a stand-alone under-$500 63-note sequencer wasn't too shabby. For comparison, the Korg SQ-10 analog sequencer was advertised with 24 notes in 1980, the Wasatch Music Systems Sequencer 1020a handled 20 notes in 1976, and the ARP Sequencer ad with the really really really creepy hand looks to have provided 16 notes for $795.00 in 1976. But with such a small ad budget and with funding rapidly running out, Jim told me that they probably only sold a dozen or so. No, not in the ad. But there is a photo in the brochure scans that Jim sent me. 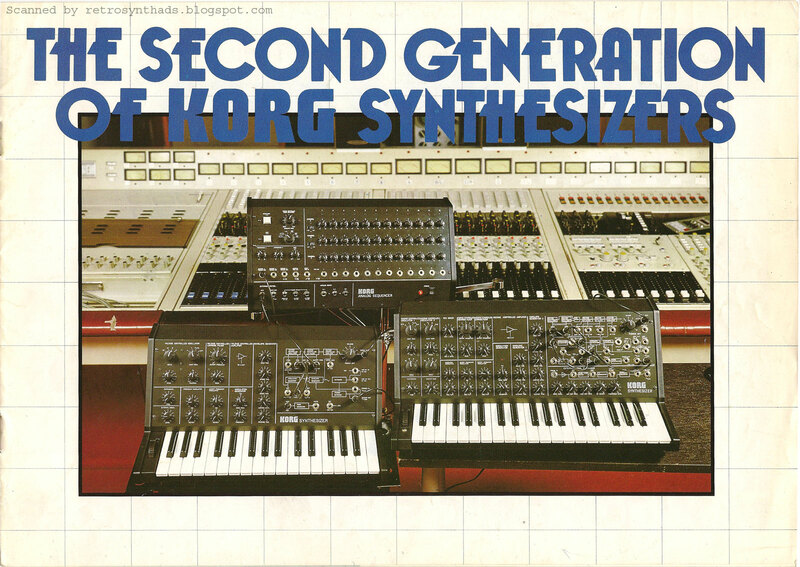 Korg MS-20 and MS-10 synthesizers and SQ-10 sequencer "The Second Generation of Korg Synthesizers" brochure from approximately 1978. I've been going strong on my Strider System posts but then last week Korg came out swinging at NAMM and I just had to interrupt my thought process to post this baby. We'll get back to Strider on Thursday, but today here's my way of toasting Korg's balls for not only doing what they did, but apparently doing it RIGHT. "Korg’s MS-20 monophonic synthesizer, first introduced in 1978, is still a coveted instrument to this day, thanks to its thick, robust sound, its powerful, iconic analog filter, and its versatile patching options. Over 300,000 people have enjoyed the distinct MS-20 sounds from the original, from Korg’s MS-20 plug-in synth, or the iMS-20 iPad app. Today, the sounds of the MS-20 have been reborn in hardware, as the MS-20 Mini. The same engineers who developed the original MS-20 have perfectly reproduced its circuitry and fit into a body that’s been shrunk to 86% of the original size, yet retains the distinctive look of the original"
Perfectly replicated, PLUS MIDI in and a USB connector. Hello! Even before it was officially announced, the rumors spread fast. 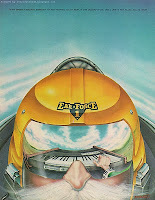 Vintage Synth Explorer's forum, MATRIXSYNTH and pretty much everywhere else. I'm surprised it was kept quiet for as long as it was. Now, I love my original MS-20, but I will be first in line at my local store to pick one of these up. Heck, I may even sell my MS-20. Well, actually... probably not. But you get my drift. This brochure is awesome in so many ways. The font choice - spectacular. And also the front cover family photo and all the individual portrait photos of the MS-10, MS-20 and SQ-10. And also all those delicious features and specifications that accompanies each piece of gear sitting on each of their opposite pages. Those are some nice spreads - each one would have made made it onto my bedroom wall beside my Annie Lennox poster. And speaking of the spreads, there was a good reason that I ended up loading the inside pages separately instead of as individual spreads. Blogger has a size-limit for images, and will shrink down larger images if you upload above the limit. When I did full spreads, they horizontal width triggered resizing and shrunk 'em down to a point that the specifications weren't even legible. Even if you shift-clicked on the images and zoomed in, the detail just wasn't good enough. I've included them below. For comparison, the above individual images were uploaded with a width of 1600 pixels. The below spreads had a width of 3200 (double). You can definitely see the difference in resolution with you shift-click on the images. Boo. But even at this smaller size they are still mighty impressive. The back page of the brochure is probably my favorite - both the colours and the photo are excellent. With the Stage Echo sitting there beside the synths. 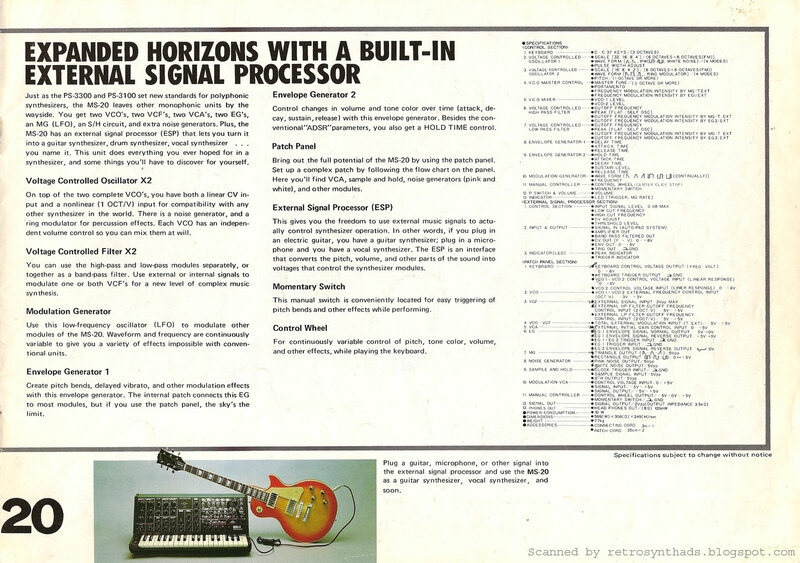 Looking back at my other posts for the MS-20 and MS-10, I realized I never posted the Spec Sheet promo that appeared in the January 1979 issue of Contemporary Keyboard, shortly after the ads for these instruments started running. 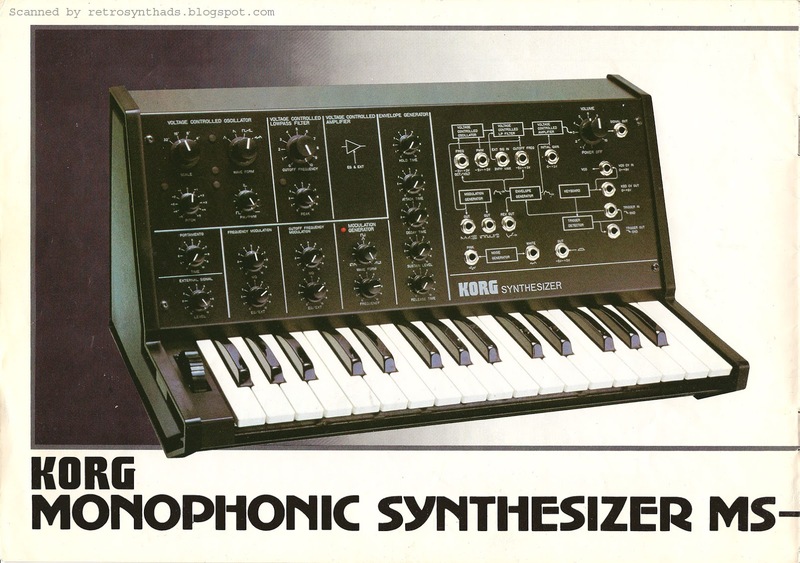 "Korg Synthesizers. The Korg MS-20 synthesizer features two 10-octave VCOs, two VCFs, a 3-octave keyboard, two envelope generators, and a programmable control wheel (modulation routing can be set up however you like). Also included are a second VCA and a white and pink noise generator. A patch panel allows interfacing with another instrument, or the MS-20 can be patched internally into routings other than those provided in the hard wiring. The Korg MS-10 is a single VCO version of the MS-20 with a 2 1/2 octave keyboard. Prices are: MS-20, $750.00; MS-10, $450.00. Unicord, 75 Frost St., Westbury, NY 11590." With the release and no doubt crazy popularity of the new MS-20 Mini imminent, I'm hoping we can expect Korg to release mini versions of the MS-10 and SQ-10 as well. And maybe it will also be the kick in the pants Roland needs to FINALLY try and bring out new versions of their XOX- line. Strider Systems, Inc. DCS II "Get ready to change what you think..." modified full-page black and white advertisement from page 53 in the April 1979 issue of Contemporary Keyboard Magazine. The second take-away would probably have to do with the last page of the brochure, and in particular the designer's choice to modify what was the DCS II introductory ad to better fit inclusion into the brochure. On a hunch I decided to revisit the three-month run of the introductory advertisement in the February, March and April 1979 issues of Contemporary Keyboard, and sure enough - the design of the ad was also changed during that final April placement - to match the brochure! The real problem here is that I'm a little obsessive and so I had to scan the ad and log it on the blog, even though it is exactly like the brochure. The good news? Its another chance to write more about something else I'm obsessed about right now - the history of Strider! As I mentioned above, the last post provided a bit of an introduction of Jim Christensen, president and co-owner of Strider, as well as some historical information on the company's initial product the DCS-1. Although that product only saw one pre-production prototype, the company did continue to design new products and grow. At the height of Strider Systems, the company had five full- and part-time staff, and during his time with Strider, Jim continued to do some consulting and programming from time to time "to keep body and soul together". "Tony Presti (Anthony Prestigiacomo), a musician from Baton Rouge who became our marketing department, convinced us that musicians would like to adjust more than one parameter at a time, for example pitch bend and modulation depth, so the joystick was a natural fit to that requirement. It was also a low-cost way to set parameters without using a knob for every parameter, and you could play the note while adjusting two parameters at once with the joystick to get the sound you wanted." "Thinking back on it, I am amazed that it only took about 18 months to the stage of manually assembling the first 6 pre-production units. Everything was changed - signal generation went from analog VCO to a digital TI chip to get pitch stability and flexibility in waveform generation, VCAs and VCFs went from analog multipliers to photo-resistors, processor family was changed from Signetics 6502 to Intel 8048." It's stories like this that make me wish I now worked at a synth company. Just to watch a new keyboard evolve throughout its development cycle. Unfortunately, the DCS II's fate was sealed before it could get into production. Strider couldn't get production up and running before their major investor's real-estate empire collapsed and the company lost its source of funding. "Fortunately, we also didn't accept any orders or up-front payments". Even though the DCS II never launched, the product did manage to squeak into the Spec Sheet section of the May 1979 issue of CK - a month after the advertising run ended. Its one of the longer promos I've seen, with a large portion devoted to its unique programming with the joystick/matrix system. Not gonna lie - I'd be drunk if this was a college drinking game where I had to take a shot every time the word "function" was mentioned.
" Strider Synthesizer. The DCS II features two polyphonic voices that can drive up to eight notes each across its three-and-a-half-octave keyboard. There is a separate synthesizer module for each note produced from the keyboard: each module has three oscillators with mixable waveforms, a multi-mode state-variable filter, and separate ADSR envelope generation for the oscillators, filter, and VCA. Forty-eight patches can be stored in computer memory. 16 of these are permanent factory presets, 16 are user-programmed sequences, and 16 are user-programmed joystick modes. The joystick mode is one where each function is programmed with a single joystick controller - one function at a time, or as many functions as you wish to move in unison at a time. The Command section of the instrument has push-buttons which let you choose the area of memory you're going to alter. By pushing one of the those buttons, and cross-referencing to another button or buttons in the Matrix section (which lists functions in rows, with a button at the top of each row to let you choose the function you're going to change), you set up just what functions the joystick will let you alter. Once you've found the sound you're looking for, you can write it into the memory, the single joystick being programmable to adjust whatever parameter you'd like it to adjust. A cassette interface is also supplied (minus cassette machine) for storage of memory. There are no controls on the front panel of the instrument other than the pushbuttons for the Matrix and Command sections and the single joystick. The unit is available in 2-voice and larger configurations. Strider Systems. Box 2934, Norman, OK 73070." 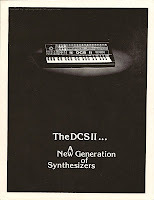 Strider Systems Inc. DCS II "A New Generation of Synthesizers" four page brochure from 1979. Whoa. I made some great strides in my research into Strider Systems Inc. last week. While trying out some different variations of search terms in Google I managed to track down one of the co-founders of Strider Systems Inc. through... get this... LinkedIn. And once I had a name and current company associated with Strider Systems, it was just one or two more steps to an email address. And then... of course... a barrage of questions. James Christensen, then president and co-owner of Strider Systems Inc, currently heads up HOLOBLOC Inc., providing support, consultation and training for the IEC 61499 standard and the optimization of software processes. Prior to HOLOBLOC, in the early 90s, James worked at Rockwell Automation (formally Allen-Bradley) building intelligent manufacturing systems. During his time there, he came up with the Holobloc idea and it became a research side project at Rockwell. When James semi-retired, he retained a license to continue development. I contacted James to learn a bit more about the history of Strider Systems, the people that worked there and the gear they were designing. Back when James started Strider Systems Inc., he was a professor of Chemical Engineering at Oklahoma University in Norman and an amateur player of guitar, banjo and accordion. His partner at the company, Roy Nelson, was a Vietnam vet, student in Materials Science at OU and part-time roadie for an Oklahoma City prog-rock band called The Jupiter Effect (not the current band of that name). 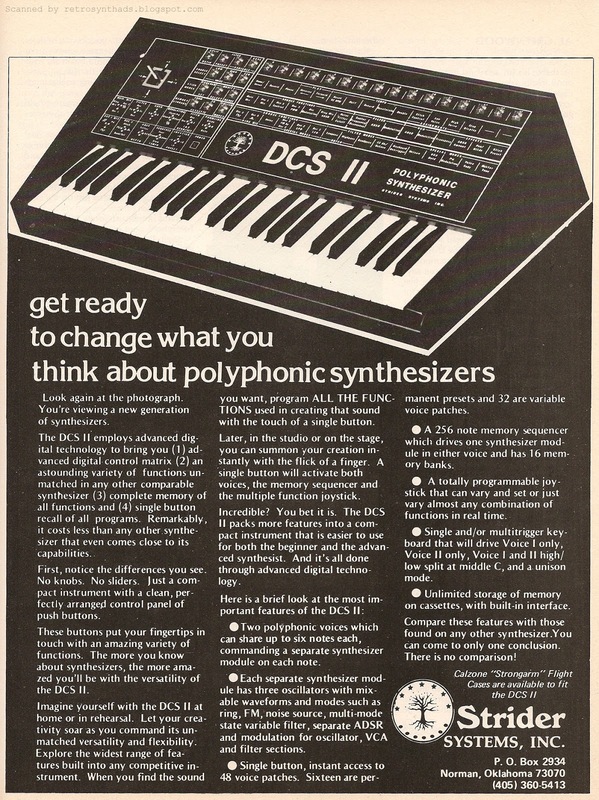 The company began in 1976 and their first product was the DCS-1. I asked James if they realized at the time that Strider was at the forefront of digital technology for the synth masses. "Yes, we did know we were pushing the boundaries. The one thing we didn't realize was that if you wanted to be successful as a start-up business you had to be where the expertise was. At the time, there were only three places that met that criterion: Nashville, LA and New York. The only advantage Oklahoma had was low cost of living. As one of our consulting musicians, Richard Bugg, said, "You can starve to death more slowly here than any place else." I also asked James how the idea of the DCS-1 came about. "The leader of Roy's band had a Mini-Moog and was continually frustrated by the fact that you couldn't change the patch setup quickly enough between songs, much less change patches during a song. 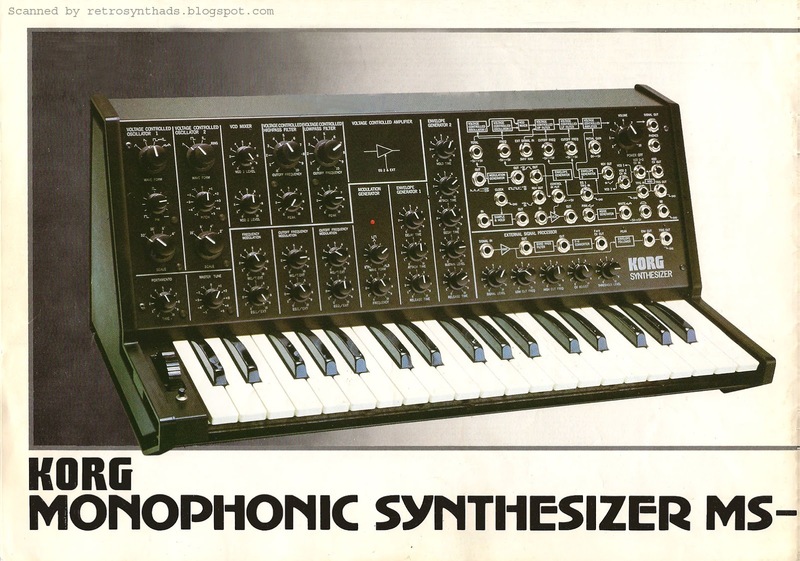 We first looked into the idea of using a microprocessor as a "digital patch memory" with offline cassette storage, but quickly found that the Mini-Moog and similar single-voiced synthesizers, as well as the existing modular synths, were usnuitable because so many of their controls were electromechanical. So we decided to see if we could do a polyphonic synth in which each voice could be controlled digitally." When asked about other influences on the development, his answer was extremely interesting to me. Normally when I ask this question, the answer will include other synths or synth makers. "A big resource was the "Musical Engineer's Handbook." Couldn't have done the analog circuitry without it. Wish we had started a few years later when the Curtis and SSM chips became available. Wouldn't have had to do the whole analog circuitry from scratch." I learned that in the end, only one pre-production prototype was produced. Strider was moving on to bigger and better things. But that's enough of the DCS-1 and the company for now. This DCS II brochure is probably getting a complex from being ignored so much. I'll have more on James Christensen and Strider in future posts. When I posted the introductory DCS II advertisement from Contemporary Keyboard, I had mentioned the cool and clean design of the DCS II. And this brochure not only substantiates this observation, but this description also applies to the brochure as well. The front page of the brochure is minimal - so minimal that someone decided it was a good idea to leave out Strider's gorgeous logo and name of the company. 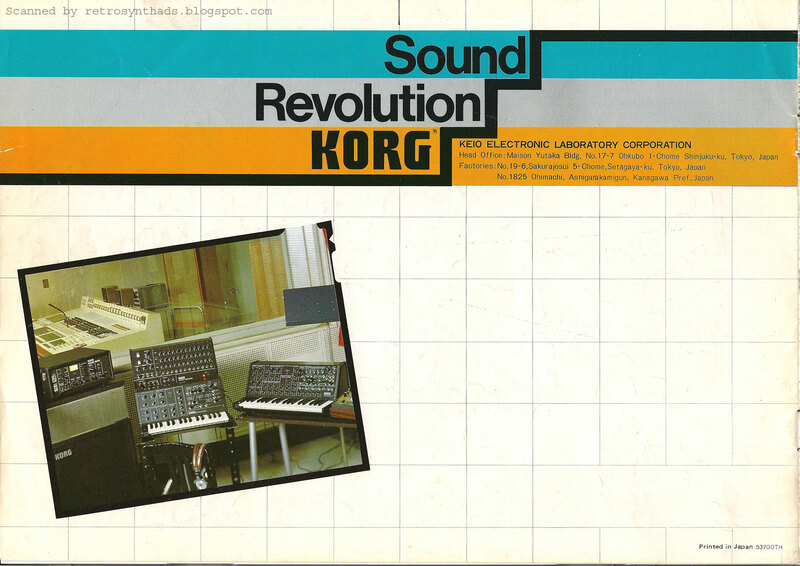 In fact, the only logo to be found that is not on a photo of the synthesizer itself is on the back page. And in fact, if I'm not mistaken, the company name is ONLY listed on the back. I'm conflicted by this. On the one hand, the company name would only clutter up that front page, but on the other hand branding is important, especially for a small company. And Strider's reverse-colour logo would look so sweeeeet against that black background. The inside of the brochure provides the most up-close detailed look at the front panel of the DCS II I've seen yet. You can make out most if not all of the labels for the functions in the matrix - simply gorgeous and unique for the time. And we get an even better idea of how exactly the matrix and joystick worked to program this synthesizer. A definite read for anyone even remotely curious about this beast. The back page of the brochure may be the most curious of them all. I can hear you yelling at me already - THIS IS JUST A REPRINT OF THE AD!!!! But there is just one thing wrong with that statement. Well first, you can't yell hyperlinks - that would be just crazy. But besides that, there is something else wrong. It's not *exactly* like the advertisement, in one very significant way. The image of the synthesizer itself. The designer went out of their way to create a new image of the synthesizer for the brochure. One that is a solid black and white. Gives it a cleaner look - nice. This new profile angle was possible because the designer knew they could remove the big "DCS II" since that is the subject of the whole brochure. A great little brochure. And the start of a great conversation with James Christensen, whom you will be hearing more about in the near future. Thanks again to James Christensen of HOLOBLOC Inc. for taking the time to chat back and forth with me a few times. Appreciated. 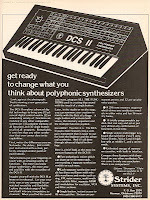 Strider Systems, Inc. DCS II synthesizer "Get ready to change what you think..." full page black and white advertisement from page 49 in the February 1979 issue of Contemporary Keyboard Magazine. 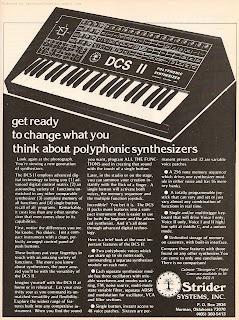 By the name of this synthesizer - DCS II, you have probably guessed there was a DCS1 - and you would be right. 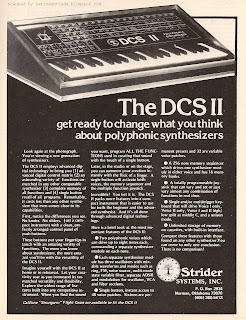 Approximately two years after releasing that first instrument, Strider Systems decided to take another crack at it and released the much more compact and synthesizer-looking DCS II. 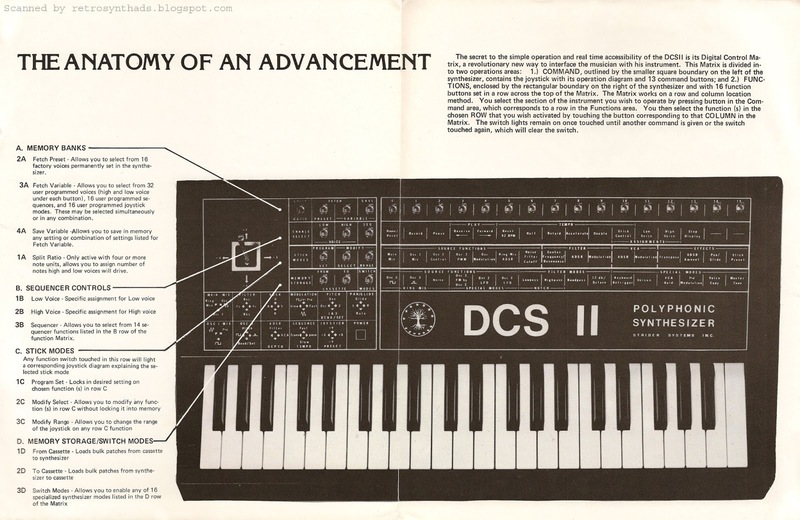 But the DCS II only looks like a normal synthesizer from afar. Get a little closer and you realize this thing doesn't have a bunch of knobs and sliders like those found on many of the other synthesizers advertised in this issue of CK. 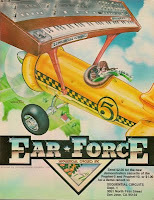 Ads like those for the Sequential Circuits Prophet-5, Oberheim Four-Voice, or Korg MS-20. The ad-copy even points this feature out to the reader early on. "First, notice the differences you see. No knobs. No sliders. Just a compact instrument with a clean, perfectly arranged control panel of push buttons." I'll be the first to tell you that I'm all about sliders, knobs and dials... but I gotta admit, that front panel does look kinda cool, clean and all digital-like. And now imagine seeing the DCS II back in 1979. And that, in a nut-shell, is what I like about this introductory advertisement. It's also as sweet as a butter tart at Christmas (yes, I'm still on a sugar high). For one - just like the look of the DCS II's front panel, the ad is pretty well-thought out. 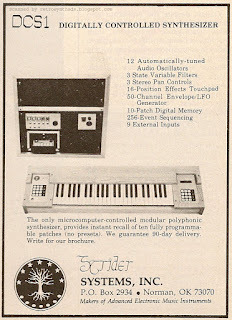 Strider obviously knew the synthesizer looked different - so they slapped a really nice large photo at the top of the page. Would definitely get reader's interest. Strider also knew that readers would have a lot of questions. How did the DCS II work without knobs and sliders? Was it like a normal synthesizer? The company needed to include a lot of ad-copy explaining it and only a full-page advertisement would get all that ad-copy in. I find the ad-copy contains a lot of good, useful information, but it is a little too friendly. It could have been cut down a bit, either providing a bit more white space or to allow the ad to include even more useful information. But it does a great job of playing up both the differences this synthesizer has with others (digital control, programming interface), as well as what it has in common. It was just as important not to alienate readers, and they made sure not to by pointing out that the underlying sound architecture was similar to other synthesizers readers may own (oscillators, filters, VCAs, envelopes). And of course, there is that lovely sweeeeeet logo. I'm a little disappointed that Strider made the decision to do away with the gaelic-like writing for the word "Strider" beside the logo that can be seen on their DCS1 advertisement (see right). But its definitely more noticeable now against the black background. And I also like how they reversed the colours of the circular logo itself to make it work with the black background in the new ad. 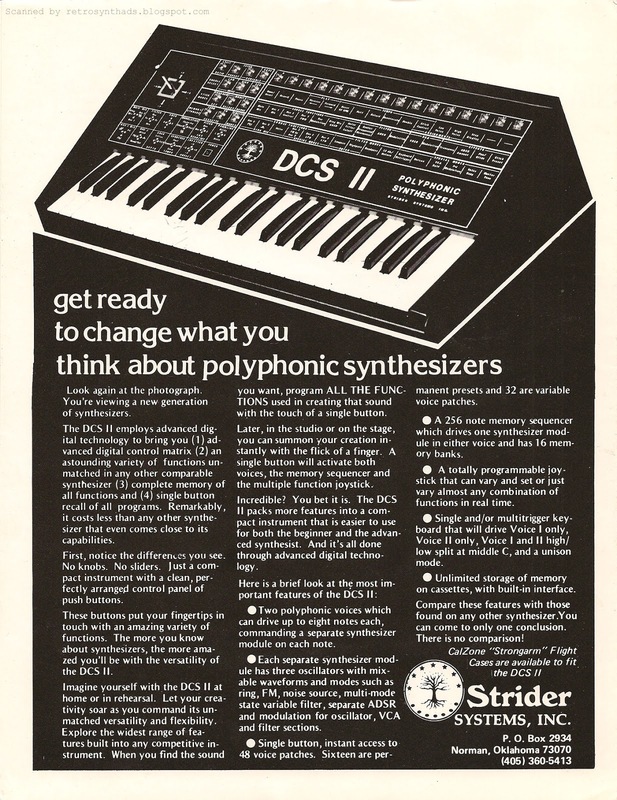 Strider Systems Inc. DCS1 "Digitally Controlled Synthesizer" 1/4-page black and white advertisement from page 36 in the November/December 1976 issue of Contemporary Keyboard Magazine. More importantly though, I gotta tell you that Strider did a pretty good job at getting the DCS1 out there considering their ad-budget for CK seemed to include this one single advertisement in this one single issue of CK. 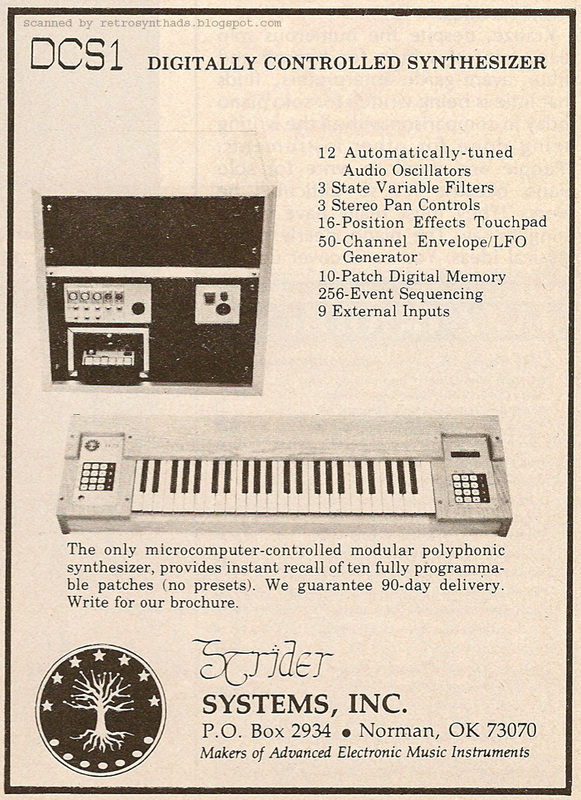 But it was a stark year for unique synthesizers like the EML Synkey with its punchcard system of patch storage so the Strider, with its unique features was sure to get noticed. And to help the DCS1 along, Strider obviously did their promotional leg work early on. 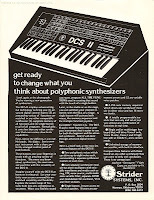 A few months before this lone advertisement appeared, readers of Contemporary Keyboard probably got their first glimpse at Strider and the DCS1 in the Spec Sheet section in the July/August 1976 issue, which included all the basic specs of the machine along with one of my favorite tidbits of info - the coveted retail price! "Strider Digital Synthesizer. The DCS-1 is a digitally controlled synthesizer featuring twelve audio oscillators (20hz to 20khz), four low-frequency oscillators (.08 to 21 hz), and a 49-note keyboard that is fully polyphonic with a programmable split. Also included are contour generators with 64 high-resolution control outputs, three low-pass resonant filters (12 db./octave rolloff)_ with fc and Q contours, and a 10-patch digital memory. A 256-note sequencer with up to four independent sequences is standard, as is tape cassette for bulk storage of patches, sequences, and computer programs. The unit measures 9" high, 48" wide, and 12" deep. It weights 55lbs. Price is $4,500.00. Strider Systems. Box 2934, Norman, OK 7369." Unfortunately, it wasn't run with a accompanying photo, which would have helped it stand out against some of the other big-gun promos that had got their photos slapped beside/on-top/underneath their promos. The list is impressive - Emu's modular synthesizer, Moog's Polymoog synthesizer and the Synthi Vocoder, who's photo looks to include the whole Synthi system. Impressive. 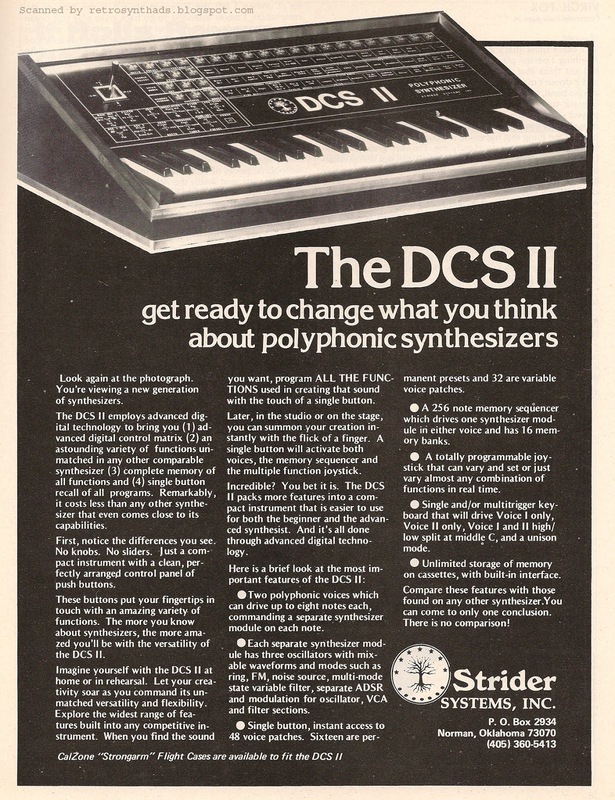 "From Strider Systems, Inc. comes the DCS-1, a computer controlled portable polyphonic synthesizer. Included in the system are 12 audio frequency oscillators, a 48 channel envelope generator, 3 state-variable filters, a 49 key polyphonic keyboard with programmable split, a 16-key digital keyboard with l.e.d. display, a 16-key programmable effects keyboard, 10-patch digital memory, 4 independent 256 note sequences, and a tape cassette for bulk storage of patches, sequences and computer programs." Not sure if Strider consciously decided to promote other aspects of the machine later in its run - in this case Synapse mentions its portability. Or it could be Synapse picked up on this on their own and decided to include it. Either way, its not in the CK Spec Sheet. Although I guess the weight of the unit is. Still, from a marketing perspective, "portable" sounds better that "55 lbs". A lot better. There isn't a lot of information sources about the Strider DCS1 out there. Offline, there is Mark Vail's Vintage Synthesizers book. It includes two long paragraphs on Strider's two synthesizers under the heading "Digital Egg Snatchers", describing the section as instruments that stole "digital eggs from the larger instruments and incorporating them into more limited, more specialized, and hopefully more marketable designs" and were the ancestors to the more modern Casio CZs, Yamaha DXs and Korg DWs. I'm not sure "stole" is the right word... but being described as the precursor to CZs and DXs is just down right cool. Page 5: DCS-1 features including a hand-written note from someone at the company named Ray or Roy! Now about that advertisement, and in particular that one little issue I have with it. The first thing I notice is the name of the instrument - DCS1. Now I'm a big fan of consistency, and this advertisement clearly doesn't include a dash in the name: DCS1. No dash. So, I wrote this blog post without the dash. But then I noticed that both the Spec Sheet and What's Happening write-ups do include a dash 0 DCS-1. And although the cover of the Chris Kann's brochure doesn't include a dash in the name, text within the brochure consistently does. Gah. But, that's probably a personal issue I should deal with. Not everyone else. But you know what else bothers me. When people write MiniMoog with a double-capital "M". 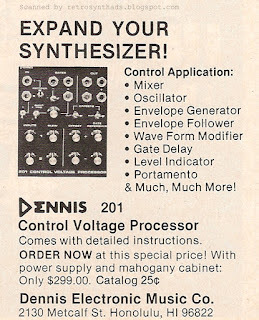 Dennis Electronics "Expand your synthesizer!" 1/9th-page black and white advertisements from page 39 in the March/April 1978 and page 38 in the May/June 1978 issues of Synapse Magazine. If you've been reading the last few posts, you know Dennis Electronics about as well as I do. Sure, I'm interested in the gear the company manufactured, but it's also been about piecing together as much of the history as I can. I wanted to find out as much as I could about Dennis, and get the info online and into search engines with the hope that someone with more information, even Dennis himself (if he is an actual person), would come across it and fill in a few blanks. So far I've posted the initial VCO module 1/4-pager that appeared in the July/August 1977 issue of Synapse and the rather dull follow-up Control Voltage Processor 1/12th-page ads that appeared in the two following issues. And in all that time I've learned very little about the company and the modules. But finally, these slightly larger 1/9th-page ads provide the space required to give us a lot more information about the Dennis 201 Control Voltage Processor. And, just like in the those earlier two 1/12th-pagers, the copy-writer had twiddled the ad a little between the first and second version to make in more effective. 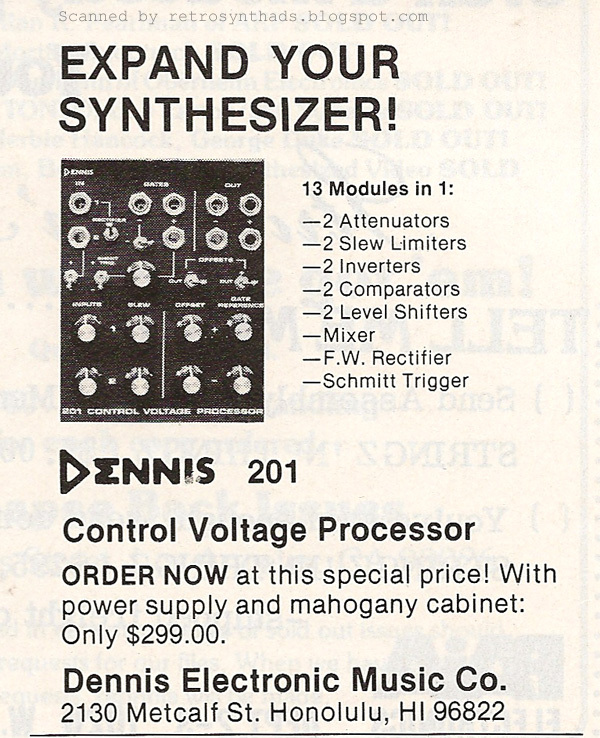 In the first March/April 1978 advertisement ("13 modules in 1") readers finally got to know exactly what a Dennis CVP module contains. And, they get to see what it looks like too. That photo may be small, but you can still pick out some of the jacks, dials and switches. And there were more than a few of them. Not too shabby, and it gets better. In the follow-up ad, the description turns from what is available on the module to what the module can process. And, as noted above, we gain a few more tidbits of knowledge from the tweaked ad-copy in this later version. All that juicy information, packaged up and nicely organized into that small little space. With room for white space to boot. And it could be said that Dennis had good timing too. With that first ad in the March/April 1978 issue, we also find out in the Notes from the Editors section that Synapse had grown from its humble beginnings to over 7000 subscribers. And that doesn't include all the non-subscribers out there picking up the issue from their ever-expanding list of distributors. A sizable module-synth-loving audience. Unfortunately, this looks like the beginning of the end for Dennis - in Synapse anyways. These were the last two ads that I could find. The company kept appearing in Listings section up to and including the January/February 1979 issue. But by the Summer 1979 issue, Synapse had done away with their "Listings" section, I'm guessing because in a way it was giving away free advertising. I did do a bit more of an exhaustive search online once I could include "control voltage processor" in my searches and came across a few online references. 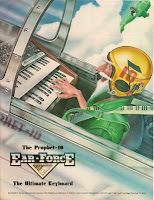 Interestingly, the more common reference was in relation to the creation of the Sequential Circuits Prophet VS! Side note: For those not familiar with the awesome Prophet VS, it was awesome and rather unique mid-80s synthesizer that allowed the programmer to use a joystick to blend four different waveforms over time. The results are some seriously awesome sounds. Lord Frito (I'm not kidding) posted an article by Chris Meyer, ex-employee of Sequential from the VS WaveWrangler User Guide from 1991 (and updated July 1999 and June 2001 by the author) called "The Birth of the Prophet". Simply put, the author was looking at the way the PPG handled waveform cross-fades and he started thinking about how to cross-fade in two dimensions rather than one. He ended leaving the office to "patch it up at home on my rag-tag modular synthesizer". "For some reason, I was originally convinced that all four waveforms had to be at exactly the same frequency, with their only differences being their waveshape (and therefore, timbre). I plunged into my already heavily-modified Oberheim TVS 1-A (Two Voice Synthesizer - a pair of old SEM modulars, a sequencer, and a three octave keyboard in a road case) and found a way to sync all four oscillators. I then dialed up four different waveforms by playing with the waveshapes, sync tuning, and filters. Since the TVS has only two filters, to create more variations I used my hand-built linear-based PAiA modular for the other two, employing a Korg MS-02 exponential-to-linear control voltage converter to make sure they all tracked the Oberheim's keyboard together. I then patched the four resulting VCAs from a custom cabinet built by Gentle Electric, using the various control voltage mixers built into it and the inverters and bias offsets in a Dennis Electronics Control Voltage Processor to perform the crossfades. 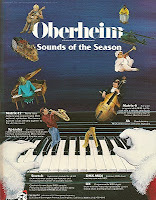 The timbre mix was animated by envelopes from a Sequential Model 700 programmer and an LFO patched in from the Oberheim. This was all mixed together and fed into a final VCA, also controlled from the Oberheim. In the end, one voice took up almost my entire collection of analog synths, spread across modules from six different manufacturers." D. R. O. O. L.
The second reference could be argued to be almost as historically significant as Dennis Electronics role in the development of the VS.
"A. Envelope Follower With Improved Ripple And Response Time (D. Genovese, Dennis Elect.)" Further searches didn't bring up anything noteworthy. But I didn't spend a lot of time (work, work, work!) - so there could be more to dig up for those with time to spare. But that brings my Dennis Electronics fact-finding missipon to an end for now. Dug up some good info, but unfortunately didn't end up finding out where Dennis Electronics ended up. Did they get out of the business completely? Did the owner or employees end up working at larger, more successful companies? Like many creatures of the lost ages, they popped up onto the timeline for a brief period and played their role in the evolution of synthesizers. 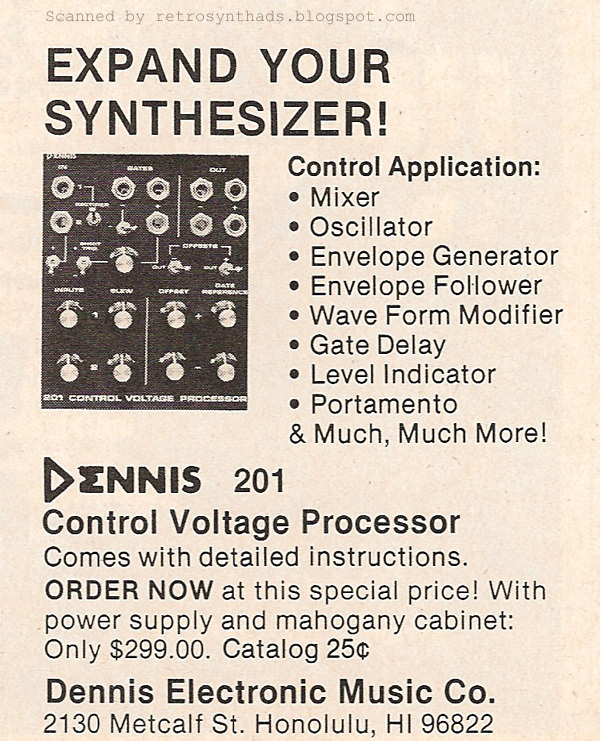 Dennis Electronics "Increase your synthesizer's capabilities..." and "Expand your synthesizer's capabilities..." 1/12-page black and white advertisements from page 36 in the November/December 1977 and page 50 of the January/February 1978 issues of Synapse Magazine. 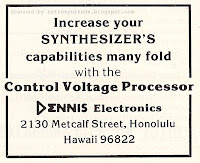 If you recall, my last blog post focused on a small Honolulu-based synth manufacturer called Dennis Electronics. I had been following a trail through old issues of Synapse Magazine to see if I could find out more info about them. By the end of the post (and up to the time their first ad appeared in the July/August 1977 issue) I had figured out that they had recently redesigned their "system" and were blowing out their old stock. Their new module was a VCO that used an envelope input to continuously modify the timbre from a sine wave to a "big fat" pulse using a technique the company described as "Dynamic Depth FM technique (through 0)". I also learned that, unlike some of the other smaller manufacturers of the time period, Dennis Electronics was not offering their modules as kits. But oddly, even with the publication of that advertisement, we still didn't have a module name or model number. Just "VCO". This time, all we get is "Control Voltage Processor". More on Dennis in a second, but first a small history lesson about the magazine Synapse itself. When I first got by grubby little paws on the 1977 and 1978 issues of Synapse as a full lot, I was told it was a complete set. But, the September/October 1977 issue was missing. For a magazine squirrel like myself, missing an issue is a rather troubling matter. It gets under my skin like a creature from Alien whenever I'm flipping through old issues, trying to track down some information. What info was I missing? What nugget of gold was in that issue that I don't know about. It was until a while later that I learned the truth. There simply was no September/October issue. And the answer had been there in the volume numbers at the top of the mags, and on page 2 of the November/December 1977 issue in the notes from the publishers - Doug Lynner and Chris August. "Don't get nervous. You haven't missed the September/October Synapse. With our move to increased newstand distribution cover dates have become a bit more critical, so this issue became November/December - no one missed an issue. Volume numbers are still the same. 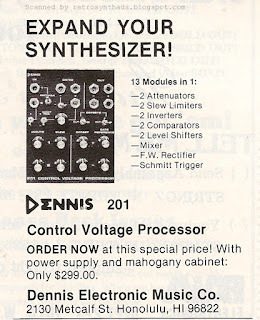 Why don't you relax, buy a six-pack with the cash you'll save by subscribing or renewing before the end of the year..."
Anyways, the point being that Dennis Electronics continued to be included in the ever-expanding "Listings" section under "Synthesizer Manufacturers" in the November/December 1977 and January/February 1978 issues of Synapse. And so telling that little cover-date story will make sure I don't get accused of glossing over a missing September/October issue by some eagle-eyed reader. And, more importantly, the fact that its an awesome little piece of Synapse history! Much like when Keyboard misprinted the date on their October 1982 issue or dropped the word "Contemporary" from their title. So, where was I... oh yeah... Dennis continued to appear in the "Listings" section at the back of the magazine. Unfortunately, unlike that Listings section, Dennis ads were NOT expanding. The exact opposite. The next two ads to appear in the magazine were these two 1/12th-page advertisements. Although they are simple little ads, they are also simple little examples of how a good copy-writer can make all the difference. In that first advertisement, the copy is a little awkward with a touch of verbal diarrhea. In comparison, that second shorter version just flows like melted butter in a reader's mind. "Increase your synthesizer's capabilities many fold"
So it will expand my synth's capabilities. Okay. But how? Even a 1/12-page ad can contain too little information. And now what? There is no call to action. Even a simple "Write for more information" or "Write for a free catalog" would have helped this ad out. I'm all for white space, even in smaller ads, but a little bit more information and a call might seduce just a few more readers to slap a stamp on an envelope. 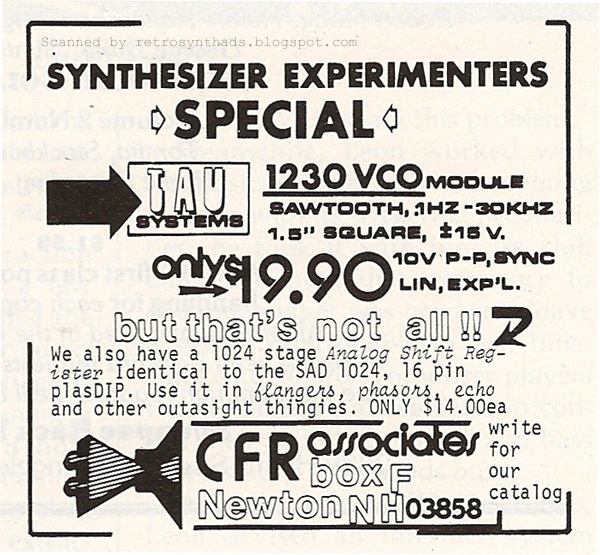 I'm not saying you have to go full-on-used-car-tv-commercial-like on reader's @sses like this CFR Associates/Tau Systems 1230 VCO module advertisement from the same issue as the first Dennis ad I've posted today. It may contain more fonts that a 1991 rave flyer and verge on unreadability, but it is more visually interesting and contains other bits of info like price, call to action and so on. Luckily, it wouldn't be long before Dennis finally figured it out. But would it be too late? 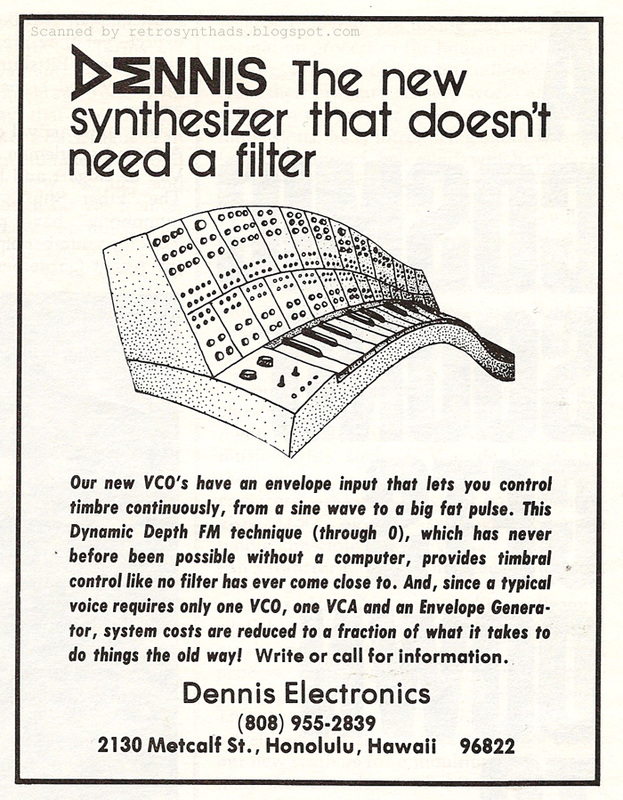 Dennis Electronics "The new synthesizer that doesn't need a filter" 1/4-page black and white advertisement from page 11 in the July/August 1977 issue of Synapse Magazine. First - Happy New Year everyone! I'm writing this post on New Years Day in the hopes of already getting a little ahead. Looking back through my forth year of posting ads, I never thought I would be able to keep up my twice-a-week blogging schedule all the way through 2012. But yet surprisingly I managed - with a few holiday exceptions. It was also exciting for me to see my little Facebook page grow to almost 500 "likes" and my Twitter to hit 1000 followers, especially since I'm not the most active user out there. The support through social media and all the emails I'm sent with comments, suggestions and questions is always appreciated. And makes blogging fun and rewarding. It was a good year for the most part and I'm hoping I can keep up the tradition throughout a busy 2013. 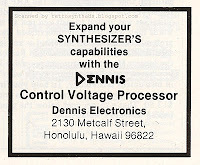 So, to begin the new year, I think this little inconspicuous Dennis Electronics advertisement from Synapse Magazine is the perfect start. 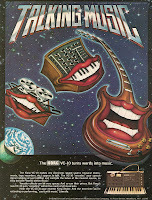 If you read the blog regularly, you know I'm a big fan of synthesizer ad-art. ..to this awesomely f*#ked-up surreal sh!t created for Korg's vocoder. The ad-copy is also really interesting for a smaller company, making a few interesting statements that would definitely get readers' attention. 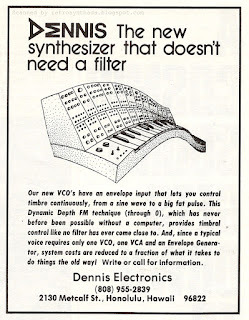 First is that description of their new VCO with "Dynamic Depth FM technique" and its curious claim of "providing timbral control like no filter has ever come close to" along with the "reduced system costs" it allowed. Quite the claim for a small company with only a quarter-page advertisement. And it got me curious to see what earlier reference information on Dennis I could find. I couldn't recall coming across the company in Contemporary Keyboard or anywhere else at the time. 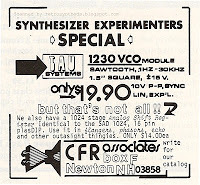 And the company name didn't appear in the index of Mark Vail's Vintage Synthesizers book either. 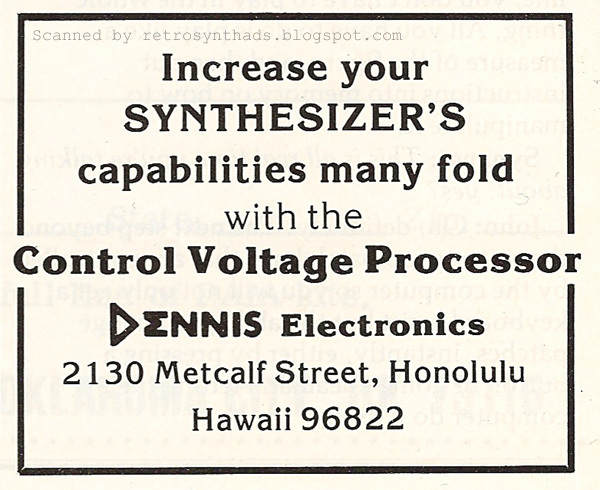 This seemed to be the first Dennis Electronics advertisement to appear in Synapse, so I decided to dig through earlier issues to see if there were any other mentions. Not a lot of information. But it was something. Dennis Electronics, a small Honolulu based manufacturer, is redesigning their system and are offering their old stock at very reduced prices. Call (808) 955-2839 for the modules available and additional information. Redesigning their systems? Interesting. And mention of their modules. Now we are getting somewhere. 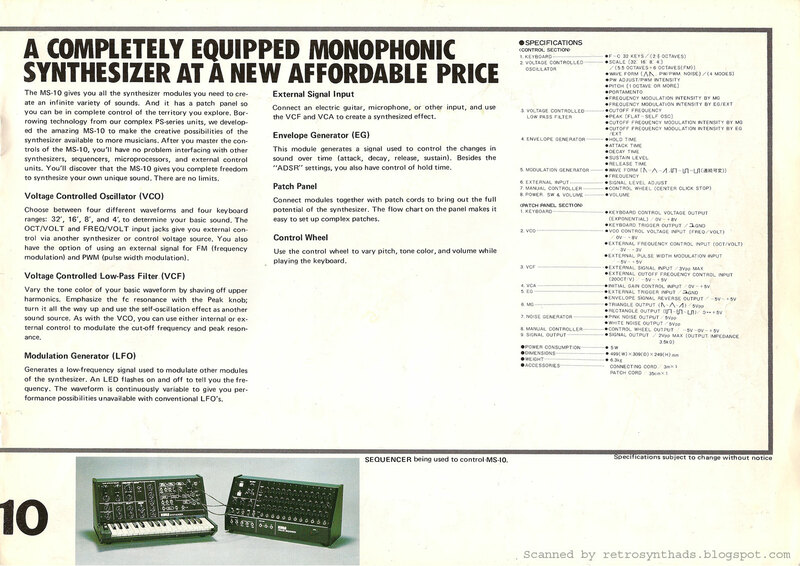 Interestingly, that manufacturers' section had grown over the last couple of issues to not only include some of the more well-known companies like ARP, Korg, Moog/Norlin, Oberheim, Roland, Sequential Circuits and Yamaha, but also companies like Aries, Dennis, EML, Musitronics, Oznie, PAIA and others. ** manufacturer makes both kits and finished products. Because Dennis had neither of these indicators, it would suggest they were making finished products only. No kits at all. After receiving my first issue of Synapse, I was surprised to see such an abundance of lesser-known systems. Is this an indication of differences in quality or something else? I have considered buying E-mu and EML synthesizers, but instead purchased a 2600 and an Oberheim 4-voice. Is there something I don't know about this situation? Also, where to get info on Serge Systems? The lesser known systems (they all were at one time) have always been there and there are more all the time. There has just never been a magazine to let people know about them. Check the Listings for manufacturers' addresses - Ed. 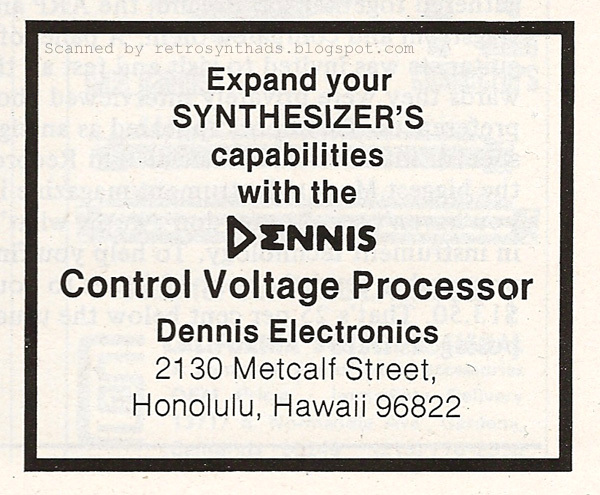 By the July-August 1977 issue of Synapse, when this advertisement finally appeared, the "Listings" sections had grown even larger, on the one hand putting Dennis on equal footing with the big guns like Moog and Oberheim, but on the other hand putting the company in danger of being lost in the crowd of more popular advertisements. A good little start to our dig into Dennis' past.